Carte Hardback (2) 135.91 lei Economic 15-26 zile +107.79 lei 1-2 săpt. Penguin Books – 04 Apr 2019 135.91 lei Economic 15-26 zile +107.79 lei 1-2 săpt. As eminently readable as the best of travelogues, it floods with light a subject too often regarded by many as a closed book. ... With emotional and psychological insight, Barton unlocks this sleeping giant of our culture. In the process, he has produced a masterpiece. ... If it can only be liberated from such a straitjacket and allowed to become its full self, the Bible might just chime once more in a sceptical age. 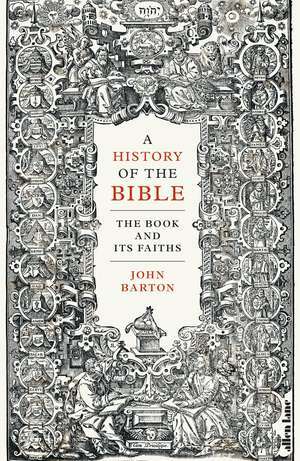 Barton's extraordinary tour de force is the first book I have ever read that makes that feel possible. This magisterial account of the book and its history ... is the book to hurl at the new atheists who quote from the embarrassing bits of the Old Testament to discredit the God project. ... It's fascinating. Hugely important ... This very readable and judicious work should be a must for preachers, teachers, and all who are serious about the Bible's place in their religion.